Signals: Will it change how you interact with your inbox forever? Have you ever been pissed with someone because they didn’t reply to a text message? You know they got it. Why didn’t they reply? Have they been in an accident? Should I call 911? Am I crazy? We make an assumption when texting people - that they will receive it, they will read it and then reply if necessary. Email has traditionally been different. This afternoon at Inbound ’13 Hubspot made a number of new product announcements. The one that grabbed my attention is a product they are calling ‘Signals’. Signals is a chrome extension that lets you see when your leads open your emails, change jobs on LinkedIn and track web interactions via Hubspot. Contrary to how they normally release products, this time Hubspot have decided to open it up to the public and let anyone have limited usage for free. Premium features get unlocked after you sign up to a standard SaaS deal of 10$ per month. For the purpose of this post the only feature I am interested in is the ability to see when a recipient opens your email. They are selling this as a sales tool. It helps you track your leads, build better relationships with them, and close more deals. Yes, it is a sales tool and I can immediately see how useful this will be for sales reps. In my opinion, this has the potential to actually change the very fabric of email itself. Not knowing whether or not someone has received our message totally affects how we interact with email as a medium. Personal email, for example, follows some assumptions. We all know people who only check their emails once a week or who are slow to reply, we get used to who these people are. We know our personal connections, we understand how they react to our emails & messages and we adjust accordingly. Now I get notified when you opened my email. This is huge. I know you are ignoring my support request. It has been thirty minutes since you opened it and still no reply. Where is the nearest social network to call you out? Now that I know you read that email and still haven’t replied enter the anxiety… is the customer going to churn? The second guessing… do they know I know they opened the email? The irrational behaviour… maybe I should email them again? The power of knowing when someone opens a mail from you is substantial and extends much further than the sales pipeline. Think M&A, raising investment, crisis management, HR. Take recruitment as an example- finding a job can be a demoralizing process. You spend time perfecting that application email and fire it off into the abyss. You have no clue if it will even get looked at, never mind replied to. Now that changes. Or cold emailing & reaching out to influencers. You can adjust follow up emails depending on whether or not they read your first email. It’s very powerful to know when our emails target did NOT open it, so we can ping them again. It gives you more information. And information is king. This feels like a tool you are not going to be able to live without. 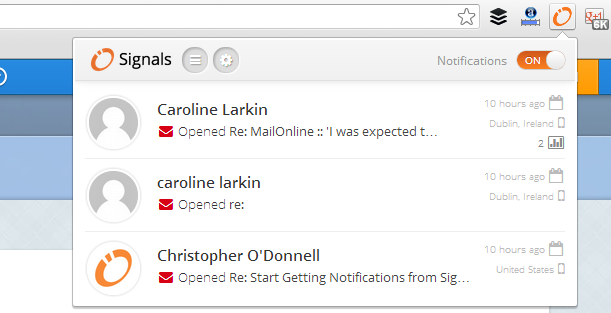 What do you think, if Signals gets widespread adoption, will it affect how you interact with your inbox? Let me know your thoughts in the comment box below.